Yuneec has been making fantastic aerial photography drones since before the word “drone” was part of the popular vernacular, and the company’s Typhoon line has consistently been one of the best in the business. But just like every other drone manufacturer in the game, Yuneec has also been living in the shadow of DJI for the past few years. No matter how advanced or capable Yuneec’s Typhoon drones have gotten, the company just can’t seem to unseat DJI from its throne.But with the Typhoon H, Yuneec is going straight for DJI’s jugular. This six-rotor beast costs $100 less than the Phantom 4, but has all the same bells and whistles — plus a few extra. But can it really stand up to titans like the P4 and the 3DR Solo? We took it for a spin to find out. The features and specs on this drone are nuts, so to make it easier on you, we’ll start with what sets this drone apart from the rest of the pack. The first thing you’ll notice is that the Typhoon H is a hexacopter. It’s got six rotors instead of the usual four — and it only needs five to fly. 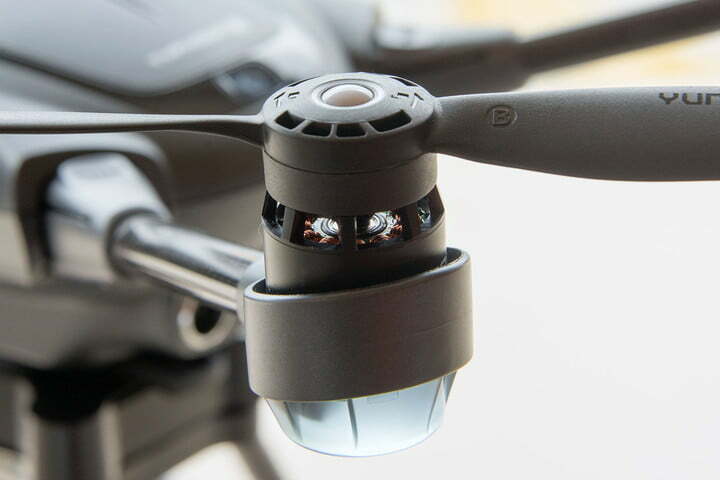 This redundancy means that if you lose one rotor for some reason, the drone will be able to recognize the problem and safely fly back to the home position for repairs. Second, unlike the P4’s camera, which can only pan up and down, the Typhoon H camera is mounted on a 3-axis gimbal that can swivel in 360 degrees. 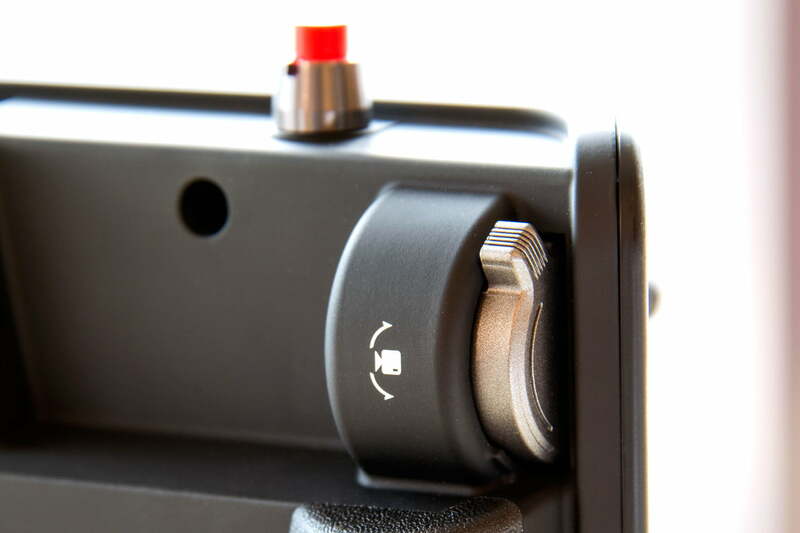 The landing gear is also designed to retract at the flip of a switch so that it doesn’t get in the way of your shots. On top of that, the H is also armed with built-in obstacle avoidance tech. Now in all fairness, the Phantom 4 has this feature, too — but while the Phantom’s sense and avoid tech is visual, the Typhoon H uses sonar, which means that it can still avoid obstacles in low light and complete darkness. 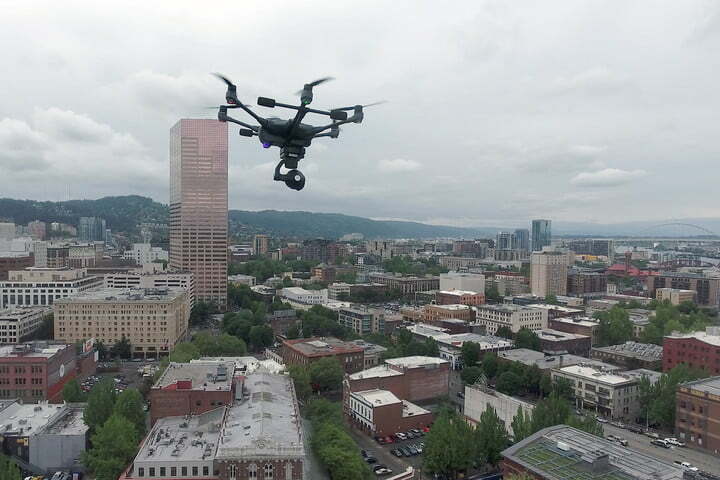 It’s worth noting, however, that the sense and avoid system is mounted on the nose of the drone, and can therefore only detect obstacles if it approaches them facing forward. Still, it’s definitely better than nothing. Another standout feature is the Typhoon’s full suite of autonomous flight modes. 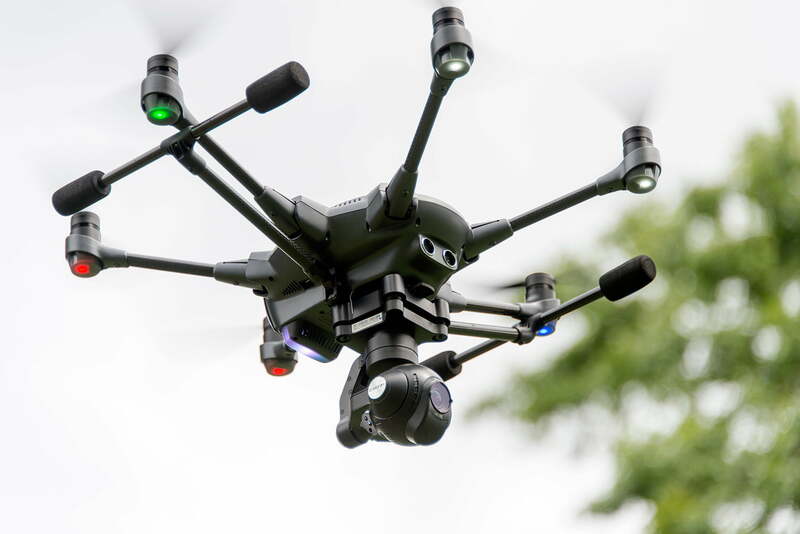 Much like the 3DR Solo and Phantom 4, the Typhoon H boasts features like Cable Cam, Orbit, Follow mode, and even a few others — all of which allow the user to relinquish control of the drone’s flight and focus solely on controlling the camera. And last but definitely not least, Yuneec’s Typhoon H comes with its own dedicated controller — The ST16 ground station. That means you don’t need to own a tablet or a smartphone in order to use the drone to its fullest — something that can’t be said of the Phantom 4 and 3DR Solo. This controller is a beast. In addition to knobs and buttons for just about everything under the sun, the controller also has a built-in 7-inch touchscreen for displaying telemetry data, streaming live video from the drone’s onboard camera, and accessing additional features and flight modes. And it gets better. The ST16 isn’t the only controller that the Typhoon H can connect to. You can actually link the drone up to two different controllers at the same time, then use one to control the drone and another to control the onboard 4K camera. Filmmakers should take note — you can’t get this kind of dual pilot functionality in any other off-the-shelf drone right now. Overall, this is pretty sturdy drone, but it’s definitely not the sturdiest we’ve ever seen. In all honesty, it feels a bit flimsy compared to the P4 and the 3DR Solo. We didn’t crash it very hard during our testing, but after a few twists and flexes, we’re not entirely convinced that the Typhoon H could take a hard tumble and live to fly another day. The root of the issue seems to be the drone’s folding arms. Don’t get us wrong — the folding arms are definitely more of a plus than a minus, but they’re also a double-edged sword. 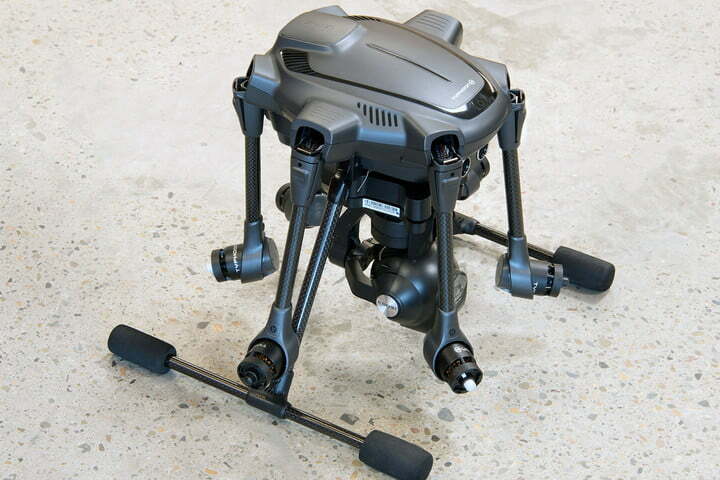 On the one hand, Yuneec’s collapsible design makes the Typhoon H much easier to pack up and transport — but on the other hand, the hinges that allow the arms to fold down feel a bit more vulnerable than we’d like. The carbon-fiber arms and legs probably won’t break in the event of a crash, but the hinges they sit on might. That said, these hinges are really the only weak point on an otherwise sturdy unmanned aerial vehicle. On-the-box specs say this thing has a 4s 14.8v, 5400mAh, 79.9Wh LiPo battery, which allegedly gives the drone 25 minutes of flight time with optimal conditions. To test the legitimacy of these specs, we popped in a full battery, fired it up, and kept the drone at a simple hover while we stood by with a stopwatch. Under the least-demanding conditions, the Typhoon stayed in the air for exactly 23 minutes and 20 seconds. If you fly it a bit harder, you can expect to get anywhere from 17 to 20 minutes of airtime before the drone freaks out and automatically flies back to its home position for an emergency landing. Once we had completely drained the battery, we popped it on the charger and fired up the stopwatch again. From start to finish, it took just over two hours to juice the battery back up — which is a pretty sizable chunk of time. So, as usual, if you plan to use the Typhoon H for any kind of serious filming, you’d be wise to snag a couple extra batteries, and maybe even an extra charging dock. As for range, Yuneec claims the Typhoon H can do a full mile before it loses connection and goes into auto-return mode. We put that spec to the test on a flat, unobstructed stretch of the Oregon coastline, and found that it’s a bit boastful. We mapped out one mile (approximately) using our car’s trip meter, then parked it to mark the boundary. On our first voyage, something screwy happened and we lost the video link somewhere around the ¼ mile mark — but all our subsequent flights took us much further before any issues arose. Generally speaking, the Typhoon’s video feed starts to get choppy at the half mile point, but will stay intact until you reach about 4,000 feet. Any further than that, and we almost always lost video — although the RC connection stayed intact for a few hundred more feet before the connection cut out and the drone flew back toward home autonomously. Flying this drone is pretty simple once you get the hang of it, but unless you’re already a seasoned UAV pilot, it’ll likely take you a few outings before you can fully wrap your head around all the controls on the ST16 ground station. The learning curve on this thing is steeper than what you’ll get with a Phantom 4 or 3DR Solo. The upside, however, is that once you master all the knobs and buttons, you’ll find that you have a greater degree of control over what the Typhoon H does in the air. The Typhoon H has everything you could want in a camera drone. Piloting is split into two main modes, the first and most familiar of which is called Angle Mode. This is basically Yuneec’s name for standard hobby aircraft control, where movement of the right joystick will trigger movement relative to the direction of the drone’s nose. This takes a bit of practice to get good at, but the alternative — Smart Mode — makes flying simple and intuitive for even the least-experienced of pilots. In its most basic state, Smart Mode is a simplified control scheme in which the drone will move in whatever direction the right joystick is pushed, regardless of the drone’s orientation. Flying in this mode also gives you access to the Typhoon’s numerous autonomous piloting functions, which allow you to perform maneuvers that would otherwise take lots of practice and skill. For the most part, Yuneec’s smart piloting modes are exactly like the ones you’ll find on a Phantom 4 or 3DR Solo — they’ve just got slightly different names. 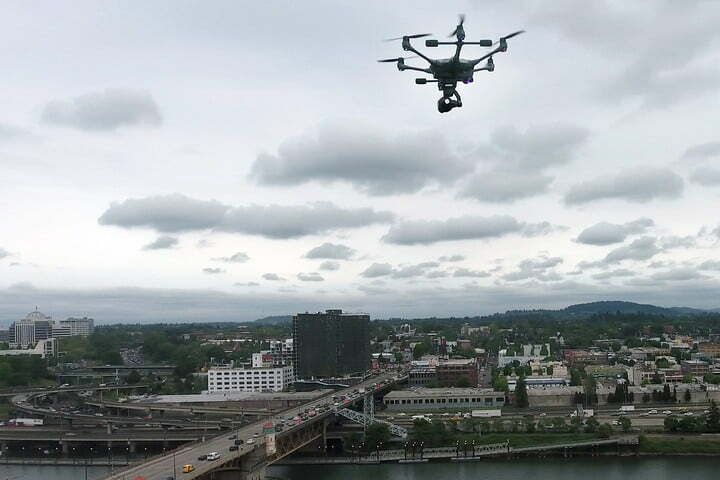 Curve Cable Cam, for example, allows you to choose a number of different waypoints for the drone to fly between — but along the way, you’ll still have full manual control over the camera. There’s also two different Oribit modes (one that circles you, and another that circles a point of interest), as well as a “selfie” mode called Jour in which the drone will focus the camera on you, then fly up and back to create a dramatic reveal shot. On top of that, the Typhoon H also offers Follow Me and Watch Me modes — both of which will track the pilot by locking onto either the ST16 controller, or Yuneec’s innovative Wizard Remote. The Wizard Remote is a brilliant addition to the Typhoon H package. 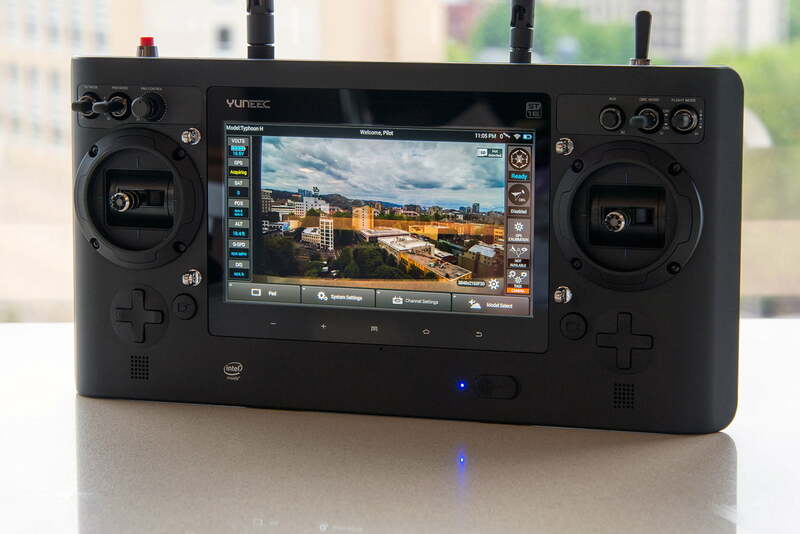 It’s essentially a smaller, more compact controller that allows users to pilot Yuneec drones with simple “point-to-fly” commands that can be executed with just one hand. Instead of using two thumbs to control roll, pitch, yaw, and acceleration, you simply point the controller in the direction that you’d like the drone to fly. Altitude, acceleration, and flight mode adjustments can all be performed with buttons under your thumb. As we mentioned before, the Wizard Remote can also act as a homing beacon during Watch Me and Follow Me mode, so you don’t have to lug around the giant ST16 ground station while you’re skiing/mountain biking/etc. With this remote, the Typhoon H basically has all the same features and functionality as a dedicated auto-follow drone (such as Hexo+ or AirDog), but without sacrificing more advanced controls. The Typhoon H’s camera — dubbed the CG03+ — is basically a souped up version of the CGO3 you’ll find on the company’s Typhoon Q500 4K. It can shoot video in 4K at 30 frames per second, or 1080p at 60 frames per second — but this beast has a bigger sensor, a faster processor, and wider field of view (115 degrees) than its predecessor. It also takes 12 megapixel still shots, and features a distortion-free lens that makes GoPro shots pale in comparison — but the camera itself isn’t really the star of the show here. The real gem is the 360-degree gimbal it’s carried by. This is a first for the Typhoon line, and it broadens the drone’s cinematic capabilities in a big way. The only other drone you’ll find with a camera that rotates 360 degrees is DJI’s Inspire 1, which costs more than double what the Typhoon H does. At this point in time, there aren’t any add-ons or attachments available for the H — but Yuneec played it smart, and designed the drone to be expandable and upgradable. The accessory bay is designed in such a way that modules (such as the camera/gimbal rig) can be swapped out in just a few seconds, and while we don’t know if Yuneec has any new modules in the pipeline quite yet, it’s definitely comforting to know that the Typhoon H is built with future upgrades and expansions in mind. 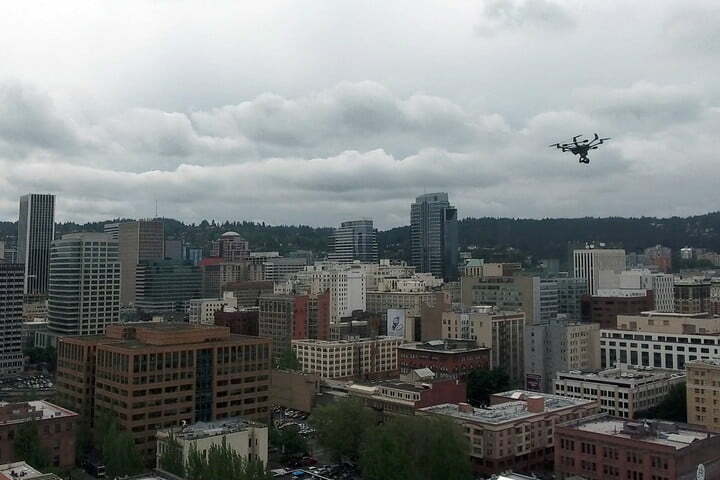 With any luck, this drone won’t be totally obsolete in just a couple years. After logging nearly a dozen hours of flight time with this drone, and flying it alongside its two biggest competitors (the Phantom 4 and 3DR Solo), we’re confident in saying that the Typhoon H is the best drone we’ve flown thus far. It’s definitely not perfect, and Yuneec could stand to make a few improvements, but overall, its bang-for-the-buck overwhelms the competition. For $1,300 ($100 less than DJI’s Phantom 4), the H has just about everything you could want in a camera drone: smart autonomous flight modes, obstacle avoidance, a dedicated touchscreen controller, and even a 4K camera with full 360-degree rotation. That’s a hell of a package, and if you’re in the market for an aerial photography/videography drone, the Typhoon H should be one of your top contenders.